Gov. 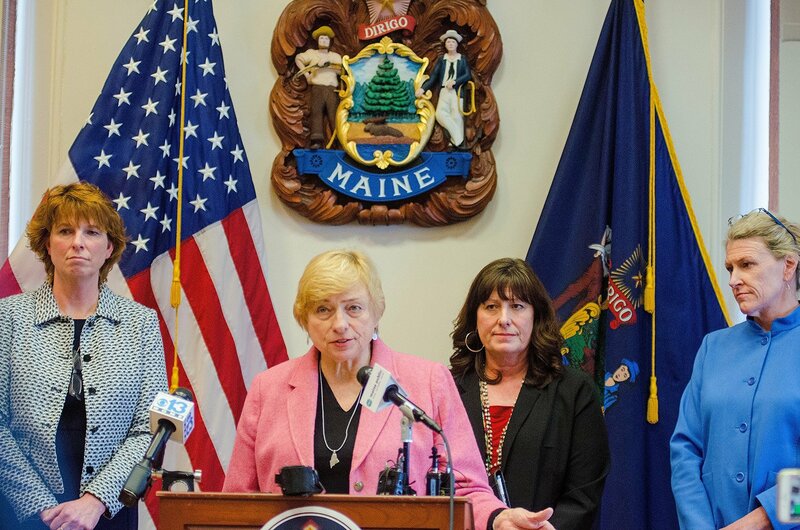 Janet Mills proposes an $8 billion plan that would increase General Fund spending 11%, saying Maine can afford to put more money into schools, public safety and municipal revenue sharing. AUGUSTA — Gov. Janet Mills proposed a two-year state budget on Friday that would fully fund Medicaid expansion, spend $126 million more on K-12 education and “rebuild” state government without raising taxes. The roughly $8 billion budget blueprint, the first of Mills’ governorship, would increase state General Fund spending by 11 percent over the current $7.2 billion spending plan. Her proposal would push Maine’s biennial budget to the $8 billion mark for first time. But Mills, a Democrat, said that even with her administration’s “fairly conservative” estimates of anticipated revenues, state government can afford to funnel more money into schools, public safety and municipal revenue sharing. The budget substantially increases health care spending, mostly by setting aside $69 million in 2019-20 and $78 million the following year to fund Medicaid expansion for about 70,000 Mainers. The money will come from the General Fund. The budget also would create a $29 million Medicaid Reserve Account to support potential additional expansion costs. More than 4,500 Mainers already have signed up for Medicaid under the expansion, after Mills signed an executive order implementing it on Jan. 3, the first full day of her term. Mills’ budget proposal also would provide an additional $5.5 million to combat the opioid crisis, fill dozens of vacant public health nurse positions, and increase tobacco prevention and cessation funding by $10 million over the two years. • Providing an additional $126 million in state aid for K-12 funding over the two-year period, plus $18.5 million for child development services. • Increasing the amount of state taxes sent back to municipalities – known as “revenue sharing” – from 2 percent to 2.5 percent next fiscal year and 3 percent in 2021. • Increasing funding for the University of Maine System, the Maine Community College System and Maine Maritime Academy by 3 percent. • Allocating money for 15 additional state police positions. • Committing to creating a pre-release center in Washington County to replace the now-shuttered Downeast Correctional Facility. • Setting the minimum teacher salary at $40,000 annually, up from the current $30,000 minimum set by lawmakers more than a decade ago. The unveiling of Mills’ budget proposal on Friday was the first step in a months-long process that will play out largely in the Democratic-controlled Legislature. Republican legislative leaders and budget writers were quick to pour cold water on Mills’ first two-year budget proposal. “We all know what happens,” Hamper said. “(The economy) goes up and it also goes down, so therefore caution and the term unsustainable.” Republicans vowed to protect Maine taxpayers and said while they took Mills at her word that she didn’t want to raise taxes or fees, they didn’t see how state spending could increase at the clip she was proposing without some new revenue coming in. Rep. Sawin Millet, R-Waterford, a former finance commissioner and previously a long-serving lawmaker, said even without an economic slowdown or a recession the current revenue forecast for the state falls short of $8 billion for the two-year cycle. He predicted the state could be facing a shortfall in the next budget. Millett also said Republicans would bring ideas to the table as alternatives when they were critical of Mills’ proposals and hoped to work with Democrats to reach a bipartisan agreement. Democrats could pass a simple majority budget bill but would have to do so before mid-April to avoid the risk of a government shutdown. Any budget passed after the middle of April will require support from two-thirds of the Legislature in order to go into effect before the end of the fiscal year. “We need to be the party that proposes alternatives when we think we have better ideas, that preaches transparency at every point in the game so that when some new initiative is being crafted, we need to know that it’s sustainable,” Millett said. Mills, however, said that as a former member of the Appropriations and Financial Affairs Committee, she is cognizant of how the economy can change. The administration based its budget on the projections of the state’s nonpartisan Revenue Forecasting Commission and did not propose dipping into – or adding to – the more than $270 million in the state’s Rainy Day fund. Republicans also pushed back against Mills’ proposal to require all public school systems to pay a $40,000 minimum wage for teachers. They called the proposal an unfunded mandate on local government that would only drive up property taxes in districts already struggling to cover their share of local education funding. “I think we would all say we value teachers and they are underpaid, but the local control issue and the collective bargaining issue, was supposedly the way of setting salaries both at the beginning and at the upper level of training and experience,” Millett said. Mills’ proposed budget will be reviewed by the Appropriations and Financial Affairs Committee in a series of public hearings and workshops in the months ahead. As with all governors’ budgets, it is likely to undergo substantial revisions before lawmakers approve the final plan. Maine’s Constitution requires that a balanced budget – one that matches spending with revenue – be signed into law by the end of the fiscal year on June 30. The governor, backed by strong Democratic majorities in both the Senate and House, will likely have an easier time getting her proposal into law than former Gov. Paul LePage, who governed with a more divided Legislature, in which Democrats controlled the House and Republicans controlled the Senate. At the same time, some Democrats in the Legislature have put forward proposals to increase taxes to pay for specific initiatives. But Mills said she would not support higher taxes. LePage successfully pushed to lower income taxes during a period of sustained economic growth both nationally and in Maine, and Republicans touted his fiscal accomplishments on Friday ahead of Mills’ budget unveiling. Majority Democrats complimented Mills on the her first budget proposal, but stopped short of saying they would back it unchanged, hinting that they may have proposals of their own to bring forward. “The Appropriations Committee will begin the hard work of crafting a budget that reflects the shared values of Maine people and I thank Gov. Mills for this thoughtful proposal that provides an excellent framework and starting point for our work ahead,” Rep. Drew Gattine, D-Westbrook, the House chairman of the committee, said in a prepared statement. Senate President Troy Jackson, D-Allagash, also called the proposal a starting point.